The clan system of Scotland has ancient origins in the Celtic, Norman-French and Norse traditions, and can be traced back to a time when people lived off the land, and border disputes were a common occurrence. The word ‘clan’ derives from the Gaelic word ‘clann’ or ‘clanna’ for children, and describes a close-knit group of relatives. However, you didn’t need to be related to the clan chief to be considered a part of the clan. Anyone who pledged their allegiance to the chief could use the clan name as their own, and this included those who worked for the clan or needed protection. When surnames came into use in the 16th and 17th centuries, many took their clan leader’s name as their own. Clans were generally associated with a geographical area of Scotland, for example, the Armstrong Clan originated in the Borders, the MacGregors in Argyll, and Clan Campbell ruled the roost across much of the Scottish Highlands. Clans often had ancestral castles too, such as Clan Murray’s Duffus Castle in Blair Atholl. Today, Scottish clans are celebrated across the world, with many descendants making the pilgrimage to Scotland to discover their roots and ancestral home. Clans names, tartans and crests are recorded by Lord Lyon for official recognition. It is believed clans started to emerge in Scotland around 1100AD and were originally the descendants of kings – if not of demigods from Irish mythology. For example, Clan Campbell claimed they had descended from Diarmid O’Dyna, a popular demigod character in Irish myth and legend, while the first head of Clan Donald was said to be a descendant of Conn, the King of Ulster. As well as kinship and a sense of identity and belonging, being part of a clan was an important part of survival throughout the troubled centuries that would follow. The constant battle for land and resources, like livestock, between clans was often ferocious. Add to this Norse invasions, English attacks, and the Jacobite uprisings, and it was no surprise that Scotland’s people sought safety in numbers. What Was the Scottish Clans’ Law and Organisation Like? Under Scots Law, a clan was considered a noble incorporation and a community of those who dwelled in the same territory. Most clans had a clan chief who acted as head of the community and controlled every aspect of clan life, from deciding who could get married to judging legal matters. Everyone who swore allegiance to the clan chief was considered part of the clan, whether related by blood or not to the chief. The clan chief was trusted to protect the territory of the clan, their dùthchas (heritage) and all those within it. If a clan gave their oighreachd (estate) to the clan leader, the chief became the owner of the land as recognised by the Crown. Land was passed on through heritable succession – when one clan chief died it was passed on to the next male in line. Anyone who lived on the clan’s estate had to pay their dues, and the payments were collected by the tacksmen, which were then passed on to the clan nobility. In addition to the clan chief, the clan nobility and leading gentry were individuals with responsibilities and influence within the clan system. For example, certain people in the leading gentry were responsible for bringing up the children of the clan. Within the clan, a chief would encourage members to marry each other to keep the bloodline pure. However, marriages were also used between neighbouring clans to forge alliances, and there were often commercial gains involved in a union, such as the exchange of livestock or land. In addition to the leading gentry, there were the clan warrior elite, or the ‘fine’ as they were called. These fearless warlords were hungry for more land, and often ready to fight for new territory or to defend their clan. What Was Clan Life Like? Life in a Scottish clan may have sounded dramatic, but what was a day in the life of a clansman really like? Most of a clansman’s time would be spent farming, tending to livestock or fields. Feeding the family would be the number one priority, as well as keeping an eye on crops. They would take their wares to market to sell, and bartering was common. Entertainment came in the form of storytelling, music and poetry, and August was the month for sports, which closely resembled today’s Highland games activities. It wasn’t always plain sailing though. Reiving was also a common part of life for clans in the Lowlands, such as Clan Armstrong near the Borders. The practice of reiving involved stealing livestock from neighbouring clans in the form of a raid. And, of course, there was the ever-looming threat of inter-clan feuds, as well as warring with the Irish Gaels and the English Tudor monarchy. Why Did the Scottish Clan System Collapse? Many pinpoint the bloody Battle of Culloden in 1746 as the moment where everything changed for Scotland’s clan system, as King George’s troops crushed the Jacobite rebellion. In what today might be considered ethnic cleansing, the ruling King of England ordered all supporters of the Jacobite cause be slaughtered, including many of the clans that populated the Scottish Highlands. This was followed by the notorious Highland Clearances and bitter disputes over land ownership, during which any final traces of Highland clans were forced on mass to the sea coast, the Lowlands or abroad. Almost every clan has at least one tartan attributed to its name, and in many cases, the design of the tartan was created by the clan chief. The idea of a clan-specific tartan emerged fairly late-on in the history of the clan system, around the 18th century. Highland dress and tartan were used as part of a clan’s identity, and today Scottish clan tartans can still be seen at Highland games or at traditional Scottish weddings. Clan members would show their allegiance to their clan chief by wearing a Scottish crest badge. The crest would normally include the clan’s slogan, as well as a heraldic crest with a strap and buckle, and could only be worn with permission of the clan chief. Similarly, a clan badge was used as a form of identification and a sign of allegiance to a specific clan leader. A clan badge would usually be a sprig of a specific plant, such as heather, oak or Scots pine, which was pinned to a bonnet or sash. The authenticity of Scottish clan badges and crests has been called into debate, and many suggest they are perhaps more a remnant of Victorian romanticism, rather than rooted in historical fact. Disclaimer: If a clan is underlined, it means there is a whole page dedicated to its history, tartan, crest, and more. We will continue to work on adding new pages on each specific clan, so keep visiting this page! We are also aware that the clan map can be a controversial topic – so if you find any inconsistencies or mistakes, do get in touch with your thoughts. What Did the Scottish Clan Map Look Like? It’s fascinating to examine a map of Scottish clan territories. 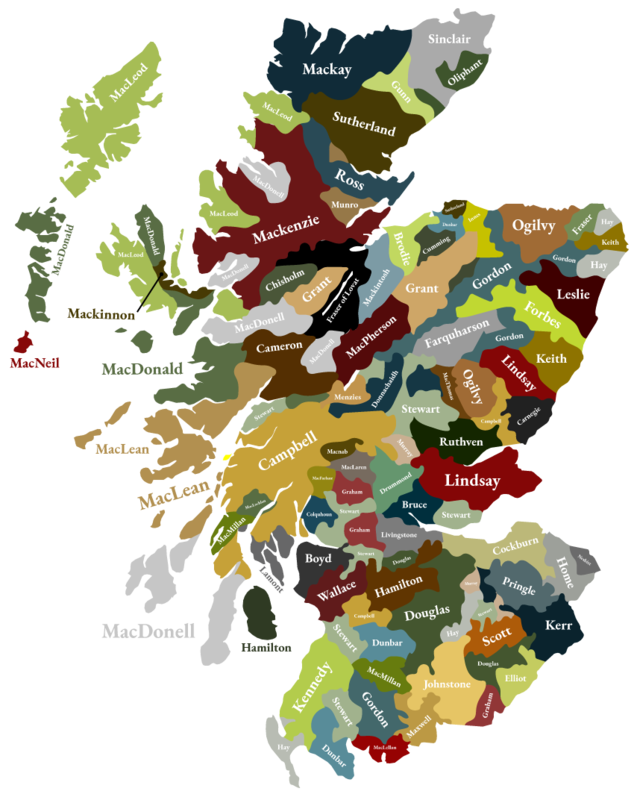 While there are numerous versions of the clan maps of Scotland, most feature a clear division between Scotland’s two peoples: the Lowland Scots and the Gaelic clans. Interestingly, the ‘Macs’ rule the north and west coast, with the MacNeil, MacDonald and MacLeod clans populating the Outer Hebrides. Unsurprisingly, the heavyweight clans the MacDonalds and the Campbells presided over large swathes of the Highlands, while in the south the Stewart, Douglas, and Murray clans found their home. While the Scottish clan system may exist no longer, it’s undeniable that Scots and those of Scottish heritage across the world continue to look upon Scotland as the treasured land of their people. Clans were a community with a sense of belonging to their corner of Scotland and an attachment to the land that they swore to protect. Much like a clan, our Highland Titles community also shares the investment and attachment to the land, our Nature Reserves, which they have helped to protect when purchasing their souvenir plot of land. In addition to the attachment to the land, our Lords, Ladies, and Lairds also have a sense of belonging to the community, and we even have our own tartan and crest! So, Highland Titles, can be considered a modern clan. Join the clan by purchasing a plot of land and continue our mission to conserve Scotland, one square foot at a time™!